FILE - A Congolese health worker administers Ebola vaccine to a woman who had contact with an Ebola sufferer in the Democratic Republic of Congo, Aug. 18, 2018. FILE - Nicole Andreacchio, second right, who is seven months pregnant waits in line to receive the swine flu vaccine from the Montgomery County Health Department at Congregation Beth Or in Maple Glen, Penn. Concerns over “theoretical harm” drive decisions to exclude pregnant women from interventions, Krubiner said. But the data scientists do have, often from women not known to be pregnant when they received vaccinations, suggest those concerns are overblown. In the case of rubella, for example, a contagious viral infection, researchers didn’t find a connection between congenital rubella syndrome and the vaccine when thousands of pregnant women were vaccinated before their pregnancy status was known. Live-virus vaccines contain a weakened version of the disease designed to stimulate an immune response in recipients. “Very often, the benefits of vaccinating do still outweigh the theoretical, or even real harms that may be posed to the fetus,” Krubiner said. One vaccine known to cause harm to pregnant women and their fetuses, Krubiner added, is for smallpox. But even in that case, she said, if a threat were imminent, pregnant women should get vaccinated, given the seriousness of the disease. The Centers for Disease Control and Prevention support that guidance. 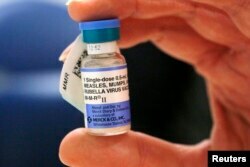 FILE - A nurse holds a vial of measles, mumps and rubella vaccine at Boston Children's Hospital in Boston, Feb. 26, 2015. The advice pregnant women receive about vaccination should reflect what’s known about the particular vaccine and the specific circumstances of the outbreak, Krubiner said. Recommendations should follow current knowledge about the disease in question, the severity of the threat, and the likelihood of exposure, she added. But the general guidance is unambiguous. “At minimum, vaccines should be offered to women, and in many cases they should be strongly recommended,” Krubiner said. Among those cases is the vaccine for seasonal and pandemic flu, which pregnant women should be urged to receive, in light of the severity of the risks tied to infection — not just for the expectant mother, but the future child as well. Pregnant women should also be encouraged to receive vaccines for H1N1, also known as swine flu, and DPT, which protects against diphtheria, whooping cough and tetanus. Involving pregnant women in the benefits of vaccines will require systemic shifts, the PREVENT group said in its report this month. An important step is to become more proactive in bringing pregnant women into what Krubiner called the “development and research pipeline.” By involving pregnant women early, she said, health care providers aren’t left with the kinds of blind spots about how vaccines will affect expectant mothers and their fetuses that lead to their exclusion. Even basic information, such as pregnancy status in case reports, sometimes goes untracked, despite being easy to collect and providing insight into the unique burden pregnant women face in disease outbreaks. More complex data collection will paint a more complete picture. Specific studies could be designed to examine the safety and efficacy of vaccines for pregnant women, for example, or to track effects at different points in gestation. “Starting anywhere at this point would be better than the dearth of data that we have right now to really try to address the needs of pregnant women and their babies,” Krubiner said. Disease outbreaks devastate communities. But they also provide opportunities to better prepare for, and respond to, the next epidemic. In this year’s Ebola outbreaks in Congo, responders have applied lessons from West Africa’s 2014-16 epidemic to community engagement. And drug trials toward the end of the West Africa outbreak produced evidence about the vaccine that’s now being deployed. But pregnant women weren’t included in those trials, and researchers collected little in the way of data about the burden pregnant women and their offspring face. “Pregnant women are continuously getting left out of the benefits of scientific advancement in medicine,” Krubiner said.